Stop before you toss those used Cisco switches in the dumpster. 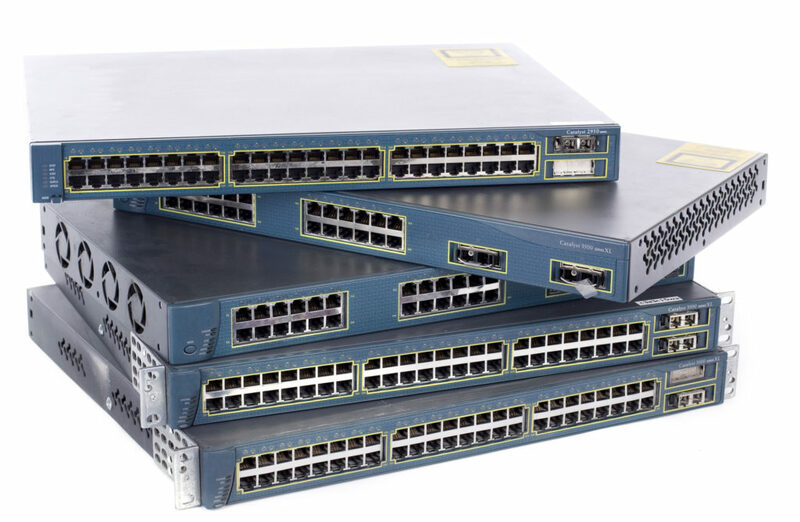 Here are five tips for Safely recycling your used Cisco switches. With only 29% of e-waste that’s created every year ending up being recycled, the remaining trash could cost us billions of dollars to clean up in the future. Before you toss your used Cisco switches into the trash, you could find another use or a recycling center that will take it. While most of us strive to live a life free of clutter, it’s inevitable, as technology ages, that we’ll end up with old machinery that’s no longer useful. It can be tempting to throw it away as soon as you no longer need it, but the social and environmental costs are simply too high. If you’re wondering what else you could do to recycle your used Cisco switches or other deprecated technology, you’re not alone. Before you clutter the landfill, why not try these 5 tips for recycling your old technology first. Lots of local libraries, waste transfer stations, and even government offices offer e-waste and computer recycling services. Used Cisco switches and related technology contain lots of components that can be recycled and reused. The glass, metal, and plastic that makeup technology can be separated and sent to recycling centers. The only thing that needs special care is the batteries they contain. Before you recycle any old technology, remove any batteries and recycle them separately. Most of the places that accept old technology will also accept old batteries. Adding those chemicals to landfills can end up putting lead and mercury into groundwater and soil. Keep an eye out for signs announcing e-waste drop-offs. Call your city council or local town hall if you want to find out more information. If you attend a school or college, there’s sure to be an IT department who can help you figure out when you can dispose of your old tech. Just because something is no longer useful to you doesn’t mean that it doesn’t work anymore. In fact, older computers that are slow but still functioning can be a great project for a hobby. If your technology still works, see if you can sell it or better yet, donate it to charity. Used Cisco switches are always welcome at nonprofits like homeless shelters and domestic violence centers. Something that’s old to you could be an upgrade to their offices. Any offices that rely mostly on donations will gladly accept working equipment. If there’s a problem that can be fixed, they might even have someone on staff who knows how to fix the problem. Contact your local school or any extracurricular programs you or your family are connected to. If you volunteer anywhere, see if they can use what you’ve got. While you can always just drop things off at Goodwill, you’ll feel better giving directly to a community that you’re a part of. If everything works, keep an eye out for any kind of drive that girl scouts or church groups are running. Old technology can be nice big ticket items that can be donated to their sales or auctions. While you might want something completely new and amazing, it might be out of your budget right now. Something that you can’t do with other kinds of technology is to mix and match components from your switches. Before you get rid of your switch, you can see if it has components that are superior to the one you’re keeping. A better internal component could cost you hundreds of dollars. If your systems are compatible, you could make the system you’re keeping twice as powerful at no extra cost. You’ll also reduce how much you’re throwing away. If you’ve got old hard drives that still work, they can be used for storing data that you don’t need immediately but will use later. Old monitors can be linked up to new monitors to the newer monitor you’re keeping. You’ll be able to extend your viewing area and actually increase productivity. In order to promote recycling and to stock their repair facilities with lots of materials they can use, companies will buy back old technology. The EPA even has a directory where you can see who is accepting old tech for recycling or reuse purposes. Search by manufacturer or by state. Check the website of the company who manufactured your technology and you might be lead to a page with more information. Companies like Best Buy will buy back electronics, even if you didn’t buy the items from their stores. Phone sellers will offer buybacks, up to a few hundred dollars, for smartphones. They’ll even offer you the opportunity to trade up. Amazon gives the opportunity to trade in your tech for an Amazon gift card. They’ll buy anything from video games to CDs, or even old computers. Some office supply companies will buy your old printer cartridges or else offer to recycle them and give you a coupon for a few dollars off. If your used Cisco switches or any other computer equipment has any stored data on them, make sure you wipe them clean. Even though you can assume the best intentions, leaving passwords saved on technology could come back to bite you. If a malicious actor gets access to your technology, they could use your password and trace your accounts. In the wrong hands, old technology could be a pretty frightening prospect. Don’t worry if your Cisco switch is aging. They often last longer than you might think. They certainly last long enough to clear anything that could be saved. If you know the deal with recycling technology, then follow the same rules for your switches. While there will be different internal components, the idea is basically the same. Your goal should be making sure your old technology doesn’t end up in a landfill. If you’re ready to start recycling or selling some of your old tech, contact us today to get started.